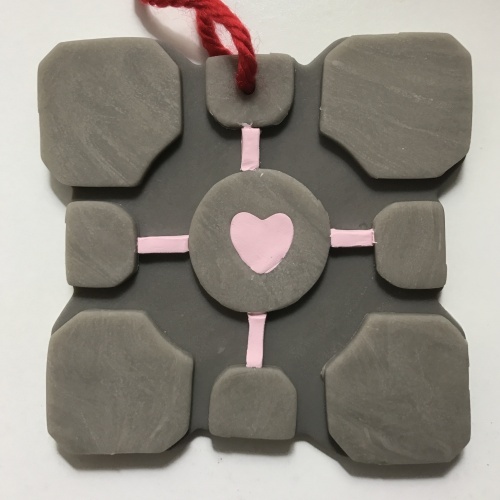 I was making a Companion Cube ornament for a geeky Secret Santa exchange, and I had enough clay left over to make one for myself too, so… new ornament! 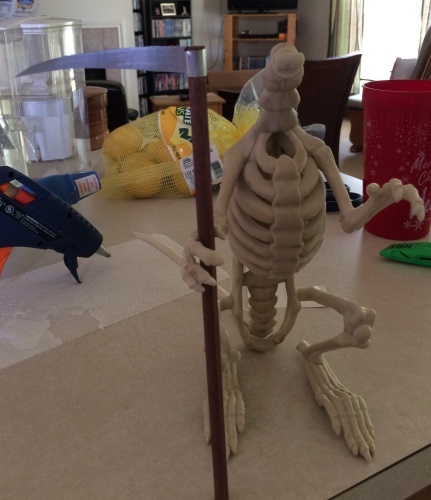 He’s made of some sort of plastic, so first I used a heat gun on his arm, to get it into a better position for holding the scythe. 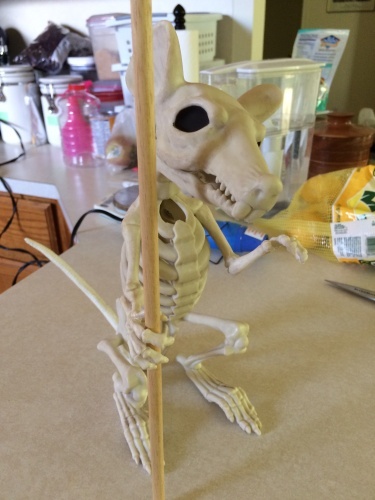 First I twisted the lower arm to get the hand in to the right orientation, then I did the shoulder and upper arm to lower the arm a bit, and finally I heated the hand and wrapped it around my dowel rod to get a nice grip. 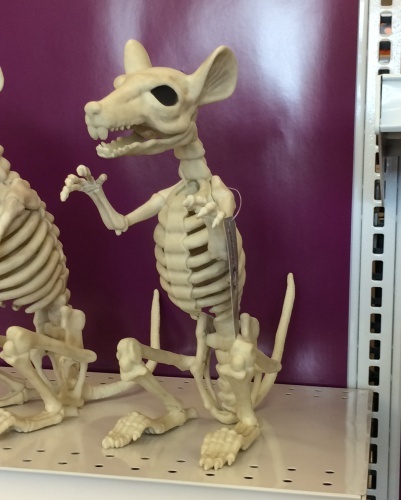 Since he’s going to be wearing a robe, it doesn’t matter that his bones are now a bit deformed. 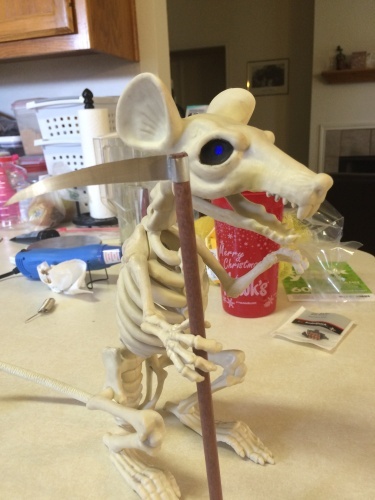 For the scythe blade I took an empty tea light, cut out the bottom and then straightened out the remaining strip. I free-handed a blade shape on a little piece of card, traced it out on the metal strip and then cut it out. I used a couple of dabs of low-temp hot glue to attach it to the dowel rod, which I had already cut to size and painted a darker brown. Uh-oh, he’s lost his head! I discovered that he was made in pieces and screwed together at various points. This was super convenient, because I wanted the blue pinprick in the eyes effect and this made life a lot easier. 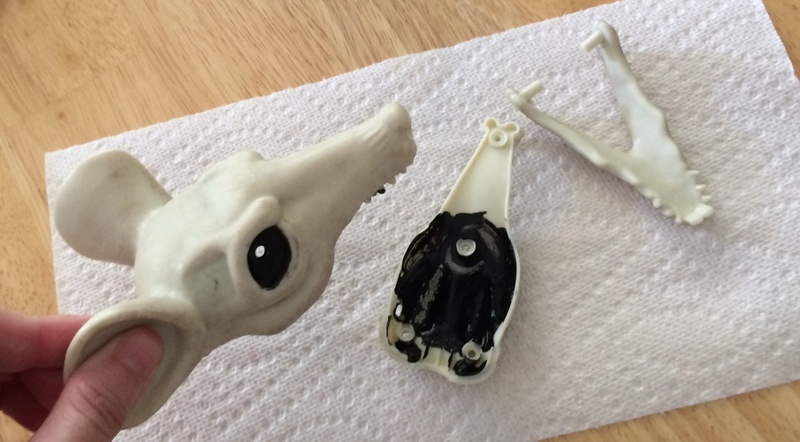 I took the head apart, drilled a hole in each eye and then dabbed a bit of black paint around the holes, and inside the skull (the theatre tech in me insisted). For the lighting, I got a 3v blue LED, a battery case for a 2032 battery and a small slider switch. I cut a hole in the back of the head for the switch. Once I get the hooded robe on it, it won’t be noticeable. 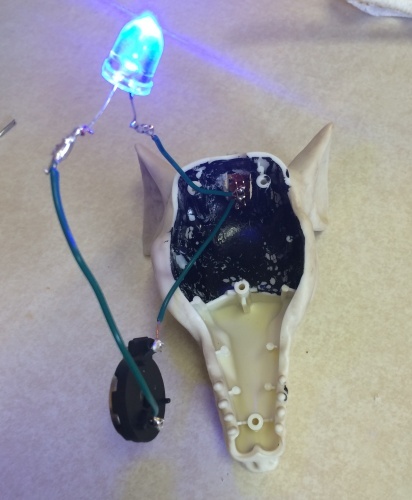 After testing my connections, I soldered everything together and added a couple of daubs of hot glue as insulation (couldn’t find the electrical tape), and I glued the battery case to the inside of the skull. Here he is with his head back on. I still have to make his robe, and I’ll post a finished picture of him once I’m done.